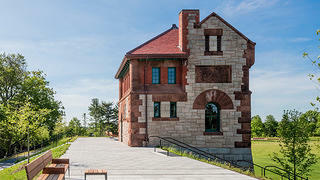 photo by: Touloukian Touloukian Inc.
It’s clear from the exterior of the square Richardsonian Romanesque building overlooking a grassy field in the town of Brookline, Massachusetts, that few details were spared for its construction. A slate hipped roof bordered with brand new copper flashing caps the structure. The mortar binding the granite blocks of the outer walls matches the rust-red color of the brownstone quoins on the corners, decorative terra cotta panels, and the voussoirs in the arches above several windows and a door. It’s a sturdy, solid looking structure. That makes sense, given that for nearly 80 years it received water from the Chestnut Hill Reservoir more than a mile away. 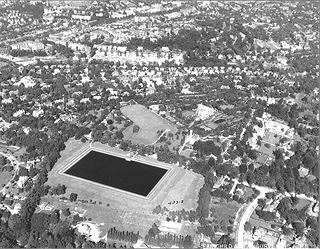 The Fisher Hill Reservoir would then dispense the water to adjacent neighborhoods in Brookline, serving a vital role to residents of the quick-growing town. Up until 2015, though, the circa-1887 Fisher Hill gatehouse hardly looked like the well-kept structure it is today. Following technological advances in water supply, the town decommissioned the Fisher Hill reservoir, draining it and shutting up the gatehouse. In the following half century, the reservoir became overgrown with invasive plants that made their way to cracks in the abandoned gatehouse where they sprouted unheeded. Extreme water damage degraded the gatehouse’s roof and threatened the structural integrity of the north wall. Openings had been bricked up or boarded over with plywood, though that didn’t prevent vandalism over the years. This aerial view shows the Fisher Hill Reservoir and Gatehouse before it was decommissioned. It seemed as though the once grand building would be forgotten forever. Fortunately, the town of Brookline saw its potential, and 15 years ago they made their first purchase of private land for the purposes of a public park in nearly 50 years. After the town released a request for proposals in 2011, the work progressed quickly. Landscape architecture firm Klopfer Martin Design Group received the winning bid. Working with Erin Gallentine, Brookline's parks and open space director, they oversaw the transformation of the reservoir into a park with a soccer field, while sub-consultant and architecture firm Touloukian Touloukian Inc. handled the restoration of the gatehouse, along with contractors Grace Thorton Corporation and Eagle Point Builders. “It’s a beautiful building,” notes Ted Touloukian. He and his team worked with Brookline’s preservation staff to develop a restoration plan (funded with public seed money) that was sensitive to the original materials of the building. The award-winning project included masonry repair and repointing, repair or replacement of the wood soffit, and replacement of the red slate roof and copper components, including a finial cap, hip flashing, and gutters. “We paid particular attention to the detailing of the copper, which we replaced with in-kind details,” Touloukian adds. The careful attention to detail paid to the copper is also evident in other parts of the restoration. The team examined and tested the existing mortar to determine the color and profile for repointing. They matched the original bluish-green paint of the wood soffit and replaced some brackets that had rotted. 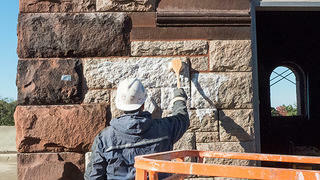 Crews carefully cleaned years of grime off the masonry. The new red slate roof will protect the interior for decades to come. New walkways surrounding the park let visitors get a close-up of the gatehouse. 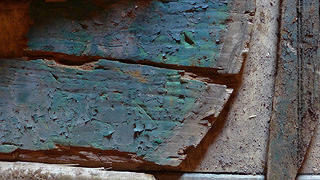 The flaking paint from the surviving door was used to replicate the color for the new door. A grant from the Massachusetts Historical Commission partially funded the reconstruction of windows and the front door. One of the challenges in restoring the building to how it looked originally was the absence of window sashes. “We enlarged historic photographs and scaled them to our drawings to correctly match the spacing of the muntins,” explains Touloukian. They also studied existing buildings built by the architect of the gatehouse, Arthur Vinal, to match the sash details and hardware. One day, in a space beneath the floor, the team found the rotted remnants of the original wooden door that had been thrown into the well. Though it could not be salvaged, the door's surviving hinges and profiles allowed the team to recreate the door to a more accurate degree. The north wall suffered the most water damage and needed serious attention. “A lot of water infiltrated the north wall step flashing and between the brick and granite. As a result, freeze-thaw cycles dislodged the [masonry] units and pushed them out,” explains Touloukian. Each granite block was numbered and removed before crews rebuilt the wall. A final cleaning of the masonry was the last step in bringing the former gatehouse back to life. 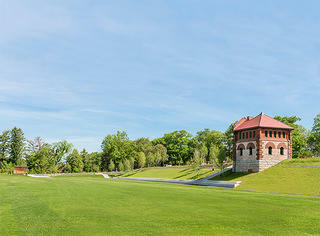 The Fisher Hill gatehouse overlooking the soccer field. The interior remains untouched, but hopefully that will be a project in the near future. 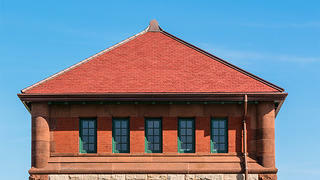 For now, the exterior of the Fisher Hill gatehouse has been restored to its original appearance. 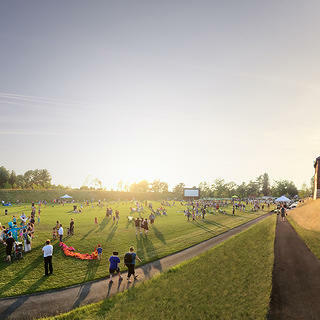 While it used to overlook a tranquil reservoir, it now stands above a grassy soccer field perfect for playing sports and hosting community events; nearby, visitors can meander through new walking paths or relax on benches.